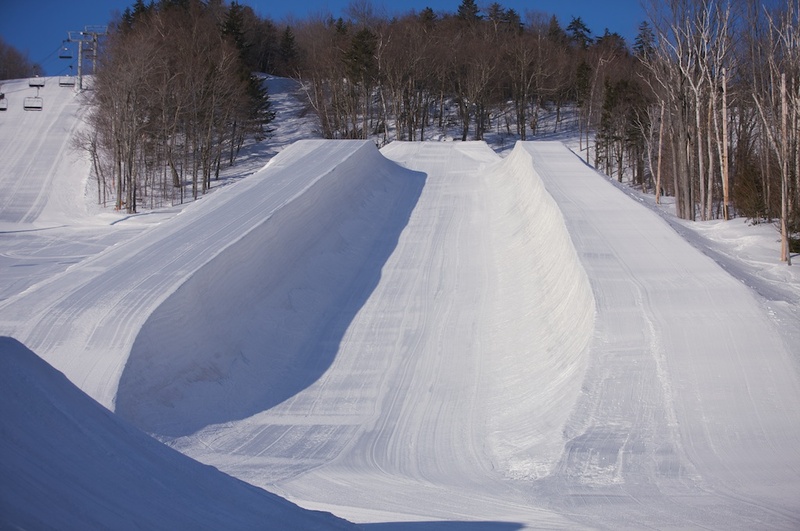 The Carinithia pipe at Mount Snow. On Sunday, January 8 kids ages 6-18 pay their age for a lift ticket to ski at Mount Snow Resort in Southern Vermont during Youth Pay Their Age Day. It is the eighth straight year the resort has provided this straightforward offer making it very affordable for families with children to enjoy a day out on the mountain, and it truly is as straightforward as it comes; if a youth is 14 years old, they pay $14 for their lift ticket. In addition to Youth Pay Their Age Day, Mount Snow also offers three Kids Ski & Learn Free Weeks (January 15 – 20, February 26 – March 2 and March 4 – 9, 2012) during which kids ages 4-12 years old get free 3, 4 or 5 day lift tickets and free half-day lessons when accompanied by an adult that purchases a 3-5 day lift and lodging package. There are plenty of events for the younger ones as well featuring Mount Snow’s Grommet Jam Series which is for boys and girls age 12 or younger to hone their terrain park skills with instruction from ski and snowboard pros followed by a friendly competition with winners walking away with prizes from series sponsors Smith Optics, Oakley, Neff, Contour and Rome. Grommet Jams are scheduled December 31, 2011, January 16, 2012 and February 20, 2012. For more information on Mount Snow’s family friendly deals, events and activities visit mountsnow.com/family-activities-guide. This entry was posted on January 1, 2012 at 3:59 pm and is filed under family skiing, family travel, ski deals, skiing, snowboarding, Vermont skiing. You can follow any responses to this entry through the RSS 2.0 feed. You can leave a response, or trackback from your own site.